We've covered this combo around here before, pairing various Irish farmhouse cheeses with Irish whiskeys. Pure yum. But can cheese be made with whiskey as an ingredient? Wonder no more, because the Old Irish Creamery is doing just that. Their base cheese is a smooth creamy cheddar, in which they incorporate a range of interesting flavours. I tried three of them - chilli, oak smoked, and Irish whiskey - with and without a glass of whiskey on the side. 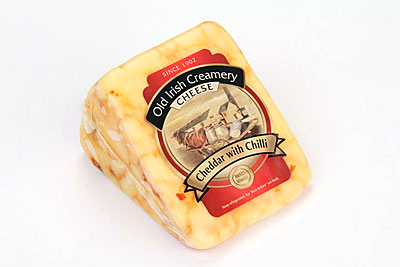 The chilli cheddar looks very attractive with its red flakes of chilli. It has a real hot kick, followed by a fascinating sweetness. It's good! It absolutely does not go with any whiskey though so just enjoy it on its own. The oak smoked cheese is also very tasty on its own (it's some indication of the affinity between cheese and whiskey that they both take smoke so well). We have matched smoked cheese with Locke's 8yo before but I discovered Black Bush works very well here. 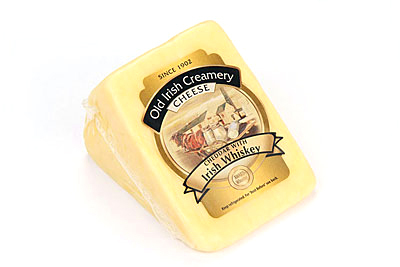 So, to the main object of interest: the Irish Whiskey-flavoured cheddar. The whiskey is Jameson, and the label says it accounts for 1.5% of the product's make-up. Does it taste of whiskey? Honestly, I couldn't pick it out. The cheese has a mild tang alright, perhaps a slight metallic finish (not in a bad way). But I think there is scope to push this ingredient further. They could either use a whiskey with a more contrasting flavour, like Kilbeggan. Or maybe they could concentrate the whiskey in veins within the cheese (like their dark-veined porter cheese) instead of evenly dispersed throughout. I tried various whiskeys alongside it, and reckoned Paddy was the best match. I tested expensive whiskeys too but between the Black Bush and the Paddy I discovered that whiskey & cheese matching doesn't have to be a pricey undertaking. The company has various other tempting flavours that I'm sure are worth a taste and a line-up against the whiskey shelf.